Hoorah, 300th Blog Post with an Oops and an Aah! An apple cake with half the recipe batter left out . . . the baked remainders landing on the floor. Double dumb mistakes. That’s not the way I envisioned marking my 300th blog post. 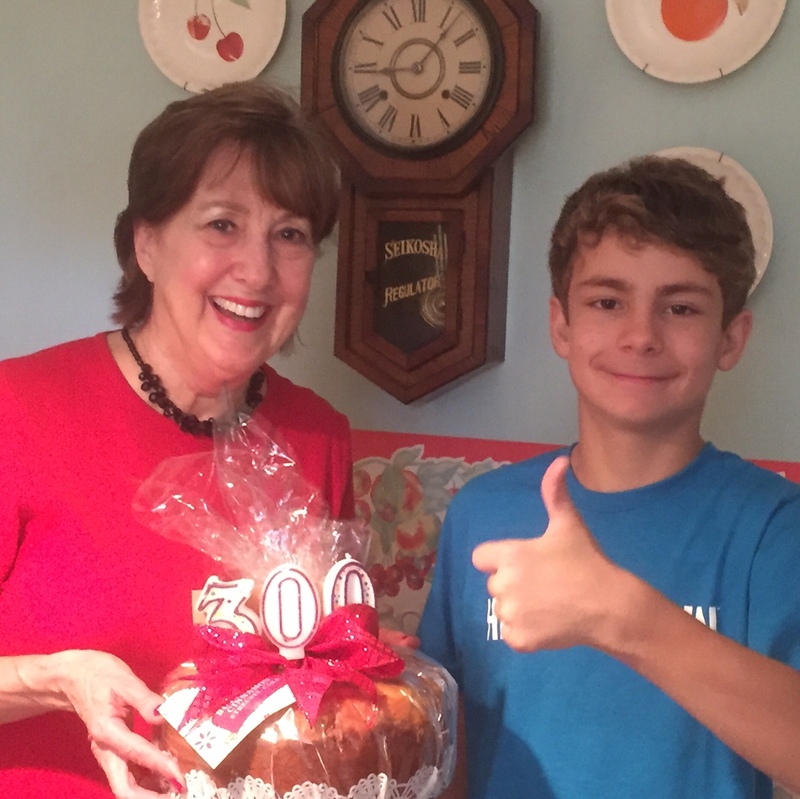 To mark this milestone, grandson Curtis and I planned to make an apple cake together, perfect for feasting two days before Christmas 2015. He likes to be in the kitchen and remembered our success with a spiced pork recipe a few weeks earlier. The ingredients were laid out, I placed cups and spoons on the counter, the tube pan at the ready. Curtis and I both donned aprons (his flowery, mine denim) and got to work. He helped core and dice the apples, careful to curl his fingers away from the knife blade. We both chatted happily over the hum of the mixer, adding apples, nuts, cinnamon, and vanilla to the mix. When the batter was ready, I poured the mixture into the tube pan and set the timer on my iPhone to a “check-me” time. Then Curtis and I sang Christmas carols around the piano, a first for just the two of us. I heard the ping, ran to the kitchen, switched on the oven light and gasped. The cake had risen to only half of the height I had expected. Then my eye caught a glimpse of a bag on the counter with half of the mix inside. Sadly, I’d failed to fold it into the batter. That could account for the low rise. Still, the cake looked edible as I pulled it out of the oven, rounded and fragrant, and placed it on a rack to cool. Just when I tilted the tube pan, the whole thing went SPLAT. Half of the cake flopped into the sink and the other half plopped onto the floor. There were moments of silence. 10 . . . 20 . . . 30 seconds? We ate a few morsels that fell into the sink. They were actually quite tasty. Then I asked Curtis what he had learned from the experience. Of course, I expected a snarky remark about his addle-brained grandma. Drizzle a little lemon juice over the apples to keep them from turning brown. Use a toothpick to test for cake “done-ness” even if you use a timer. Insert a toothpick between pan and its lid on the stove to keep a simmering mixture from boiling over (his Great Grandma Longenecker’s trick). When you remove a pot from a hot burner, put a teakettle with a small amount of cool water over the burner to absorb the heat, especially during hot weather. “It’s not that bad,” one of Curtis’ own sayings when things go awry. “Life doesn’t have to be perfect to be wonderful,” another wise saying making the rounds these days. Curt and I played Scrabble afterwards. He won, but not by much! Blend oil and eggs into cake mix as directed. Add vanilla & cinnamon. Then add apples & nuts. Pour into tube pan and sprinkle brown sugar on the top. Bake at 350 degrees until done. Pour icing over top of the cake. Melt 1cup brown sugar, 1 stick of butter and ½ tsp. vanilla. Stir until dissolved. Pour over top of cake. 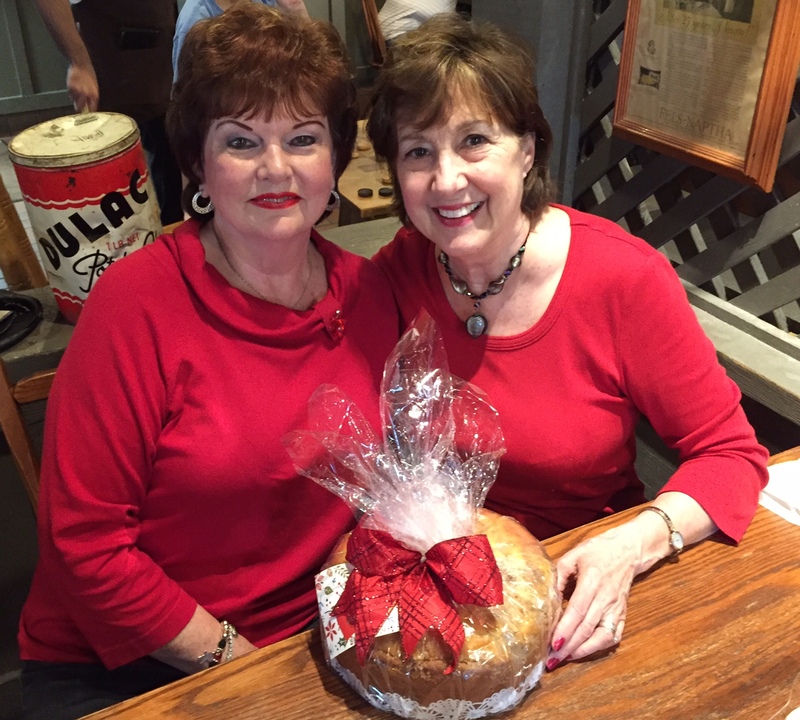 Out of the blue, the very next day at breakfast my long time friend Wanda Rogers Long presented me with a perfectly baked apple cake – glittering in cellophane and topped with a red bow! Several weeks later I baked the same cake with better results for my husband Cliff’s January birthday . . . Most everyone has a similar story whether it’s a mishap in the kitchen or someplace else. Here’s where you can tell yours. Was there a happy ending to your story – Yes? No? Definitely a happy ending this story–a memorable time with your grandson, along with a great story :)–and a surprise the next day from a friend. It sounds perfect. Who doesn’t have kitchen disasters? It’s part of cooking. 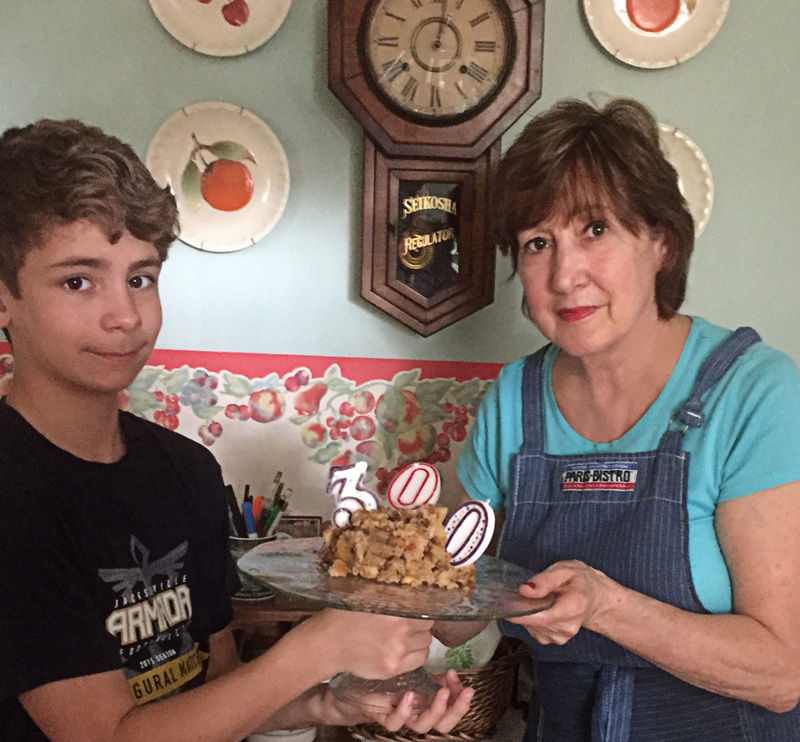 I may have mentioned that when we went to our daughter’s apartment to meet our future son-in-law’s parents, the cake she made did not turn out, so she asked him to buy ice cream, and she turned it into a crumble. I once had the stove top crash to the kitchen floor during a holiday dinner. It knocked the big pot of soup on the floor–splatters of bright yellow pumpkin-yellow split pea soup everywhere! Fortunately, everyone had had a serving, but no seconds or leftovers for the next day. I want to know more about the pumpkin-split pea soup. How in the world did the stove top crash to the kitchen floor? There’s a story your readers would lap up. Ha! Of course, everyone remembers projects that go awry more vividly than those that turn out perfectly. Thanks for opening the door to more culinary story telling here. I think I did mention this incident in a post at some point. I’ll have to check. It was actually the stove hood–sorry, I was not being precise. We were eating dinner, and the hood just fell down onto the stove top, knocking the pot onto the floor. Thanks for the link. Such a story! I noticed it published in February 2013, my very first month of blogging. Maybe I’ve missed how many eggs and how much oil? Though I’ve been back a few times to check? I love Grandma Longenecker’s tip re: toothpick between lid and pan so’s to steam .. 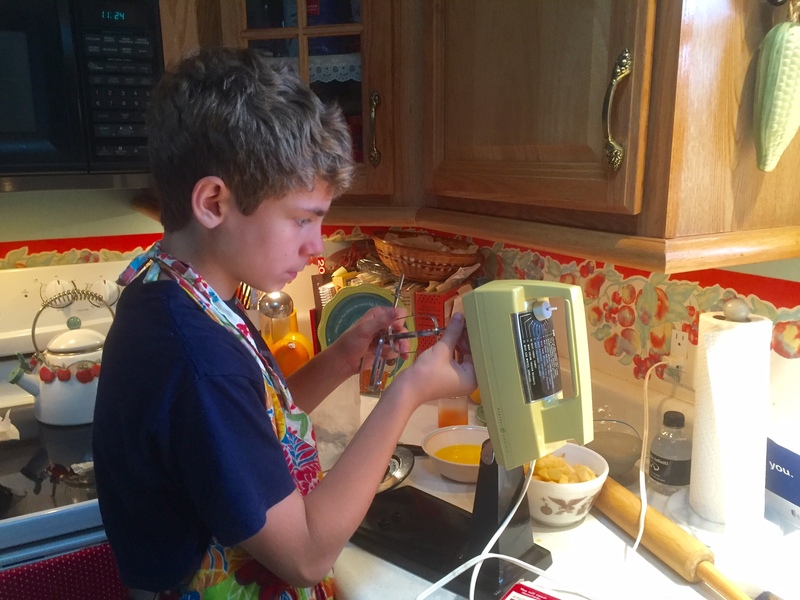 I seldom use a recipe or timer – the timer story drives my husband a bit nuts. Thanks Marian and what a friend in Wanda! HOW did she know! The eggs and oil are added to the cake mix. I don’t have the box anymore, but I am certain there were 3 eggs and I’m guessing 1/2 cup of vegetable oil. The exact proportions are on the cake mix box. About my friend Wanda’s awareness – I told her about my baking disaster, and she gave me a cake she just happened to have bought a day earlier, not knowing she would be the answer to my dire need. Thanks for asking – you may have clarified questions for other readers, Susan! Well I chuckled and drooled the whole way through this story, Marian. I’m jealous of your geographical proximity to your grandchildren. This kind of event is not as likely to happen when you are snatching days together and plan “special” activities. It seems to require a different kind of time — “daily” time to give it a name. The kind of time we had with our grandparents on the farm. I don’t get the teakettle lesson. The teakettle has water in it and gets hot this way? Congratulations on 300 posts. You have always been an entertaining, inspiring blogger, and you keep getting better! Shirley, I realize how blessed I am to have our grandkids close by. For ten years both families lived in Chicago and our visits were sporadic as you describe yours now with Owen and Julia. You may be surprised how your situation can change over time. Your sharp eye caught me with sloppy writing – unclear pronoun reference and lack of explanation, but you got the point anyway, which I have since clarified in the post. Yes, water in the cool teakettle absorbs the heat from the hot burner. Floridians who used AC from May – September find ways to keep the kitchen as cool as possible. This is one of my tactics. Well, it all sounds like a lot of fun to me. Making a cake is a bit like taking a trip: one must enjoy the journey and not just the destination. When making a cake, it is not just about the product that comes out of the oven, but the preparation itself. I think Curtis is a very wise man with his kind and encouraging words and I think he just loves being with his grandma, cake or not! You are right of course! I think one reason for the baking “goof” was that I was enjoying the process and being with Curtis so much, I got distracted. Thank you for the encouragement, Fatima. I love your grandson’s attitude. You always learn something! Shortly after I broke my ankle three years ago, I made a trip to Alberta while still in the air cast. It had snowed during the night and when I went to the car the next morning, I was hesitant about walking on the snow in my air cast. My then 11 year old grandson turned to me and said, ” It is highly unlikely they would give it to you if it wasn’t suitable for all kinds of weather.” They can be so logical. Just love them!! I am sure the cake tasted very good. Your grandson has the insight of an adult. Of course, the scripture is true: “A little child shall lead them.” Even a plucky lady like you needs an injection of courage every now and then. It’s even more special when it comes from a wise grandson. BTW Happy 300th post!! I look forward to many more. Thank you, Darlene, for appearing as a smiling pop of encouragement in red and yellow – so appreciated. What a nice friend you have, Marian. I’ll bet your grandson’s cake was still yummy. I’m sure your dad enjoyed that chocolate confection even if he sipped it from a straw. If you have a “search” feature on your website, maybe I can check out this post. The cake mishap was still yummy and we ate what had fallen into the sink. I just wish there was more of it! Thank you for following my blog today, Jill – so appreciated. Oh you’re welcome…I thought I was already following, but I saw your post on FB. When I was a teenager, we were all busy in the kitchen preparing a company meal. My mother asked me to drain the corn. I lifted a pot lid and saw yellow. Assuming corn, I held the lid mostly closed to drain the corn and, happily chatting away, failed to notice I was actually pouring chicken gravy down the sink. Mother was not happy. What a memory, Arlene! I remember a framed saying on a friend’s wall that said “Assumption is the mother of all screw-ups.” I think that saying applies perfectly to your story. I hope your mother could eventually see the humor in the mishap. I am so glad to see that I’m not the only one who has baking disasters, though I’m sure the ratio of yours to mine would be something like 1 to 76! I haven’t even begun to recount all the “horror”! Looks yummy and you made a memory for your grandson, one that included some giggles, I’m sure. Blessings! Even messes make memories as you mention. Blessing back to you too, Jenn. You’re a wonderful writer, baker and grandmother, Marian. Congrats on the 300 posts! At least he didn't call out, "Five second rule" as soon as it fell, and scooped it onto a plate to eat! Thanks for the belly laugh at the end. I did think about the 5-second rule for five seconds and then abandoned it for the five ounces that had fallen onto the relatively clean sink. The mess was actually delicious. I will be sure that Curtis reads these comments! Thank you, Marylin. Marian, I love you as my friend, but I think it would be really fun to have you as my grandmother. What lucky grandkids you have, to have such a wonderful grandmother! Keep on writing your fabulous stories!! As you know from your blog posts, it’s such a delight to hear from the other side of the computer screen. Imagine what will happen when your book comes out. Artist Cliff’s first impression of your cover was that it was inviting – simple and elegant. Thanks too for your kind words, Joan. I am glad you learned from the mistakes. I really cannot figure out why half the batter would be in a bag though, you mixed it that way? You had to mix something into just that half of the batter?? Also, put a plate on top of tube pan, then when you flip it over there is no where for it to go but right onto the plate. Then it is set right as the top of the cake in a tube pan is the bottom of the finished cake. I’ve never made an apple cake, that I can think of. Is is just diced or grated apple in a batter? Why is it in a tube pan? Is it more like a pound cake? Your friend had bought an apple cake at the store? I wonder if they sell them here. I never look at the bakery stuff unless I am getting some hamburger buns. I really cannot remember any major errors, though I am sure there were some. I am guessing we are not just talking for getting to turn the timer on and burning a tray of cookies. But my mother who is NOT a baker in any way and does not enjoy it at all, did the following. My husband and I were gone for a couple days and when I came back the oldest girl said we made dessert!! It was a trifle, with cake bits and whipped cream and jam and sliced fruit. It was delicious. The children were all under 10, maybe even under 8. The youngest boy shared the truth later…they couldn’t get the cake out of the pans. Eliana and Andreas the 2 oldest knew to grease and flour the pans but did not realize that my mother had not done that step. So that is why they just dug it out of the pans and called it trifle. To answer your questions, Athanasia. As the mixer was running, I failed to add the rest of the cake mix which would have contained flour and other ingredients to make a decent cake of the proper consistency. Yes, I know about the plate trick for de-panning, but didn’t use it the first time. The recipe called for chopped/diced apples, not grated and a tube pan, a good investment for my next foray into apple cake baking. The cake my friend gave me contained apple, I’m sure, but not as much as this recipe required, making it so moist and apple-good. My friend said she bought the cake at Costco, which may or may not be in your area. Thank you for adding your grand-children story, a lesson they won’t have to repeat! Yes a tube pan is nice for heavy cakes like fruit cake and pound cake. You should be able to find many recipes to make many more delicious cakes. No, we do not have a Costco close by, though their is one in 2 largest cities that I know of. My 2 oldest children I mentioned above, both lived in the capitol city when they were in college and they shopped there, and still do whenever they visit. I like their large bags of unbleached flour. I understand now about the missing ingredients. Probably out of sight and out of mind. Out of sight, out of mind – my mind was on other things! I almost made your mistake yesterday! I was making a banana cake since I had a pile of ripe bananas. I thought I would try a new recipe. It called for cake flour, which I normally don’t bother with but this being a new recipe I wanted to follow the directions. I was ready to pour in to pan and realized I only added half the flour. I had counted out 2 cups, but it was really only 2 half cups. I scoop the flour out of the box so I always use the half cup measure as it fits in. So I quick had to add another 2 half cup scoops. It was a good cake too. Marian — I loved this virtual tour of your kitchen adventure: the highs, the lows, the twists, the turns, all captured on film. I especially appreciate that you shared the whole bloomin’ escapade; the good, the bad (that turned out to be good). Ya gotta love happy endings! 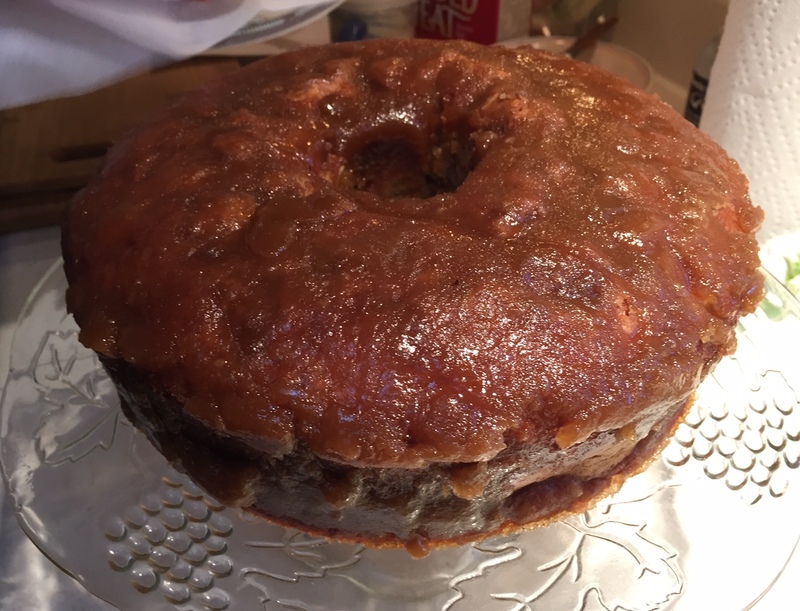 I remember when my mother made a “Tomato Soup Cake.” She got the recipe from a women’s magazine that was promoting Campbell’s Soup. Oh my blessed word, it was absolutely awful! Oh, my children love that cake! There is a children’s book called, Thunder Cake by Patricia Polacco, and it is about a little girl afraid of the coming storm and her mother distracts her by making the cake. The recipe is in the back of the book. I make that cake every year for the teacher when it comes time to read that book to the class. Use the recipe from the book though. I think the can of soup is probably supposed to equal the 1 cup of water and 1/3 cup of pureed tomato but maybe doesn’t work out quite right, as you did not like it. I like when conversations become threesomes, like here. Thanks for offering the idea of tomato soup cake, Laurie, even if it did make me turn up my nose. And to Athanasia: Thank you! Athanasia — In honor on my mom, I’m going to have to find the book and give its version of “tomato soup cake” a try. Thank you so much for recommending the book, I sure appreciate it! Oh good, and it was her grandmother…I noticed I typed mother. The book has lovely illustrations, too. I’ve heard so much about “tomato soup cake” since being married to Woody. Seems his mother made it and it is his favorite. He keeps trying to tweak the recipe so I like it too. Alas, we aren’t quite there yet. Never heard of tomato soup cake until now – where have I been? Or, how friends come through when you have a kitchen disaster! That was amazing, and I love you sharing the boo boo, because you seem to like to have things just so, more or less! In 20 years, there will be other lessons Curtis draws from your time to together. Your “hoorah” here reminds me of my oldest grandson’s new favorite word apparently, “hooray.” He drives up to his house, “hooray.” He arrives at daycare “hooray.” His parents aren’t sure what book he picked it up from but it’s cute. And congrats on 300 posts, I’m just a little ahead of that! Blessings always! Hoorah – hooray! I think your grandson and I speak the same language. You are right: I do like to have things just so, but I realize more and more that boo boos are a part of living, especially with the distraction of grandkids as you too are realizing. The same thing applies to my cleaning practice, a departure from being super neat in years gone by. Now I use the gasp & swipe practice, hitting the high spots. Ha! 😂Sorry I really shouldn’t laugh …bless you . What an a lovely young man your grandson is and just look what you have BOTH learned from your accident …it all turned out well in the end . Your friend came to the rescue what would we do without our friends in times of crisis . Happy 300 birthday 🎂🍾sorry couldn’t resist the cake . I really don’t know how many blogs I have been a part of but I ve loved every one . Once I did a very slow stew , it was in the oven for ages , we were all looking forward to it . Everywhere …it went everywhere . Cherry, I’m not sure why the stew went everywhere. Was it too hot from being in the oven so long? Was there a hole in the container? You got my curiosity up here. I see happy emoticons above your name, so now you can laugh about it, I guess. Thanks for stopping to add your story here. Glad you enjoyed mine, too! Sorry Marian my explanation was rubbish . Yes obviously it was hot but it slipped out of my hands . I seemed to deal with it very calmly but stipulated to the family no one was to help because if they came into the kitchen I may have screamed blue murder . I recall us ending up having egg and chips for supper . ..a firm favourite over here in the U.K . Egg and chips sound like a good substitute. Probably no one cared anyway since being together was the most important thing. I am tickled sometimes at your expressions, like “blue murder.” What I hear often is someone screaming “bloody murder,” but that may be cursing to a Brit – ha! This was a delightful post, Marion. Thank you. I’d love a cup of tea while we cut into that (second) apple cake. While you pour, I’ll tell you about the time I confused egg YOLKS with egg WHITES. Yes, that will make quite a difference in a chiffon pie. I was in college and trying to impress a boyfriend. Made an impression all right! I suppose the boyfriend was not Woody, as I imagine you didn’t know him then. About your recipe, I’m guess you chose the yellow over the white with disastrous results. Soon we’ll have tea (or something else liquid) together. I’m looking forward to time together in the cozy log house. In the meantime, stay calm and carry on – ha! He is such a kind and positive boy! For that I am thankful – and for your faithfully being part of the conversation here too. We all have kitchen disasters. Mine are often when I’m trying to write at the same time as cooking not a good idea! Your grandson sounds like a fine young man. That apple cake recipe – delicious. Marje, welcome to Plain and Fancy! I just poked around in your blog and notice you are a woman of the world with a loving family including a black sheep – ha! My kitchen is upstairs from my writing studio. If I put something on the stove, even on simmer, disaster often ensues. Lately, I’ve been setting my stopwatch for an alert. Thanks for reading and commenting here. Do visit again soon! Thanks for the welcome to Plain and Fancy. Lovely blog name. We have one of those alarm bells on our cooker when the food is ready but often I just can’t bear to tear myself away from my writing! Oops…..
You confessed to something interesting: being unable to tear yourself away from writing. I think such has happened to me on occasion, but I let seconds pass, not minutes because the smoke alarm in my kitchen is sure to go off with a hideous sound. So you have alarm bells on your cooker itself. Thanks for sharing here and letting me know more about stoves in Scotland, which is where I think you are living now. Yes, there is a difference: England and Scotland. I was confused – sorry. I suppose your cookers are similar though. Love it, Marian. Love your grandson’s wisdom and your wisdom and wit. I love the way a little disaster becomes a big teaching experience. And how friends such as dear Wanda so often save the day. Hmm… A big favorite of my family is yogurt-cream cheese banana pie in a graham cracker crust. A few years ago, my son requested it for Christmas, but told me his fiance didn’t like bananas. “I’ll make two,” I thought. “One with bananas and one with blueberries.” They were beautiful. I sprinkled them with crushed walnuts and put them in the refrigerator to set. I pulled the banana one out and put it on the counter–or was I trying to handle both at once? When I pulled out the blueberry one, I dumped it on the floor. Upside down in a house with five dogs running around but obeying my commands to stay back (my two and my son’s three dogs). Splat. Nothing to save. I wanted to be an A+ Mother-in-Law. I think it was best to show her I could stay calm in a “crisis” and let her know I could mess up and didn’t mind if she did, too. I saw the whole “splat!” in high-def video, Elaine. Oh, my gosh! Of course, you are still you an A+ Mother-in-Law to Liz, who intuited you intention and lessons I am sure. Somehow I was too intent on making this a stellar learning experience for Curtis and failed to see the little bag of half-used mix hidden in plain sight beside him. 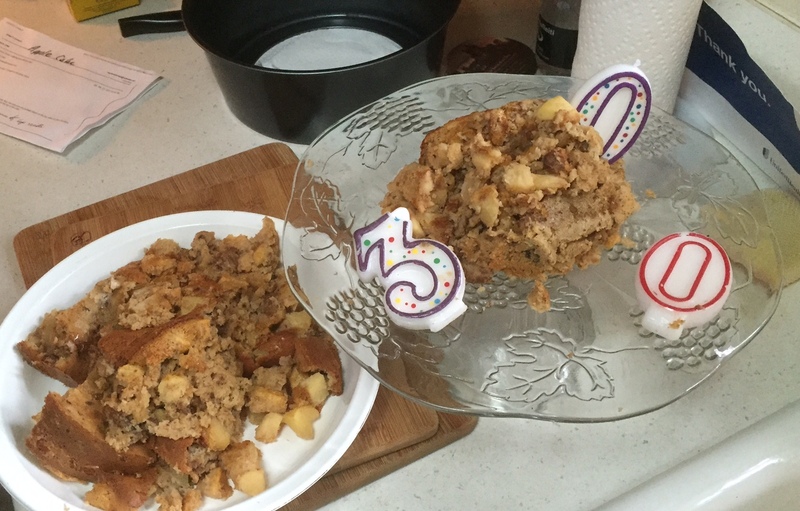 That first apple cake was destined to be a disaster, it seems. Try, try again, and you found success. And don’t I know it! There is probably a sequel to the blueberry pie dessert too. Congratulations, too. That’s a lot of wonderful blogs. Oh dear! I recently made honey and lemon pudding and forgot the baking powder. Luckily, a little custard and they were fine. It’s surprising what you can leave out and still have an edible end product! Uh-oh! But you are so right – doctored up recipes can be tasty too. When my gravy turns out too thin, I just add more cornstarch dissolved in ice cold water. Presto! Not the same thing as leaving out an ingredient, but you get the idea. Thanks, Marie. I so enjoyed this story! Recipe looks yummy too! After the party Cliff agreed to give a chunk of the cake away – so yummy but high calorie – which neither of us needs right now. Thanks for stopping by and leaving a comment, Dorothy. Well, enough of cliches and truisms. Thanks for showing up here especially after a trying week, Judy. Thank you for the acknowledgement here, Diane. I just checked out your Valentine post, making more memories count. I’m glad your story had a happy ending; it’s a sweet tale on many levels! Yes, many levels and three generations to boot. Thanks, Rebecca! So glad everything turned out well Marian, what a delight your grandson is 🙂 I’ve had more than my fair share of disasters in the kitchen, including a lasagne that spilled over the entire oven. Messy!! Many congratulations on your 300th post, that’s an awesome achievement! Oh my goodness, Sherri. I imagine the lasagna was spilled over a HOT oven which would make the clean up even worse. But such incidents become memorable moments we can share with each other. Right? Thanks for the kind words. Sometimes it’s hard for me to pause and appreciate a milestone like this because I’m always pressing on toward a new goal. I wonder if you may have a similar inclination. Anyway, thanks for reading and commenting here, Sherri. You are most welcome! I was hoping for a perfect cake since I had the “perfect” baking partner, and I was so disappointed. However, as you can see you could read a much more interesting post with the mishap. Of course, I’ll take your admonition to keep on with the writing, but now I’m in PA taking care of family business and having a short hiatus. A good thing.